Pictured at the March CC awards night are from the left (back) Brandon Phillips, Simon Bradshaw, Sam Mason, Andrew Wright, (front) Ryan Wright, Tyler Phillips, Keith Coburn and Nathan Oliver. 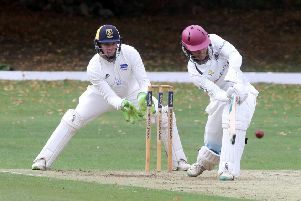 March Cricket Club skipper Tyler Phillips picked up the Cambs League Division Two trophy at the club’s annual awards night. The presentations were made by Cambs League chairman and Cambridgeshire CCC secretary Keith Coburn. Winners of the annual awards were: Saturday 1st XI- Tyler Phillips; Sunday 1st XI- Andrew Wright; Saturday 2nd XI- Steve Hinson; Sunday 2nd XI-Sam Mason; Saturday 3rd XI-Ryan Wright; Saturday 4th XI-Simon Bradshaw; Young Player - Brandon Phillips; Most Improved- Nathan Oliver; Clubman of the Year - Bill Crumly.